How do I place my closet organizer order online? Determine whether you need a Reach-In or Walk-In closet organizers (Reach-In closet organizers' shelf depth is 12", and Walk-In closet organizers' shelf depth is 16"). Click on "Showroom" tab to see pictures of closet organizers layouts and get ideas. Click on "Reach-In Closet Organizers" or "Walk-In Closet Organizers" under the categories on the left, and choose your color option by clicking on the picture to see detailed product information. Then click "BUY". The item will be added to the shopping cart, and a list of accessories available for this item will be listed. You can view and click "BUY" any of the accessories listed to add to your shopping cart. Or you can click on the "Closet Accessories" under the categories on the left, and choose "Reach-In Closet Accessories" or "Walk-In Closet Accessories" to add Doors, Drawers, Towers, Shelves and more. And you can click on "Closet Hardware" to add Closet Baskets, Valet Rod, Pants Rack, Tie Rack, and more. When done, click Checkout. You can also click on "Closet Catalog" to view, and print our entire closet organizers products offering. You can also buy items online directly from the catalog. Orders are typically shipped within 1-2 business days. The actual shipping times vary depending on the location of the recipient of the order. Typically, shipping time is 5-7 business days, and a lot of orders arrive in 4 business days. Once the order does ship, it is easy to track your package(s) on our "Track Order" page. When calculating shipping times, please keep in mind that weekends and holidays do not count as business days. Does solidwoodclosets.com have a Showroom so we can see the products? Yes, our Showroom and corporate offices are located in Southern California in the city of Glendale. 815 Milford St. Glendale, CA 91203. Our Showroom and business hours are: Monday - Friday 9:00 AM to 6:00 PM and Saturday 10:00 AM to 3:00 PM. You're more than welcome to stop by and take a look at our products. Please email or call us for an appointment. 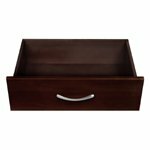 Does solidwoodclosets.com offer wholesale prices? What methods of payment does solidwoodclosets.com accept? Solidwoodclosets.com accepts most major credit cards (MasterCard, Visa, Discover, American Express) Google Checkout, and PayPal as payment. We can also accept echecks, checks, money orders, and fax orders, if the customer calls us to place the order over the phone first. Our customer service representatives will take your check order over the phone and send you a receipt via email. Once we receive your payment and process it, we will process your order for shipment. Do you ship orders to Alaska, Hawaii or International? Yes we do. You must contact us via email for shipping charges. Please note that "free shipping" promotion does not apply to locations other than US 48 contiguous states. Does solidwoodclosets.com ship to APO Addresses and P.O. Boxes? At this time, due to the rigorous paperwork and delivery issues involved, we do not provide shipping to P.O. Boxes or APO addresses. We ask that you provide a physical street address for shipping purposes. By Law, Sales Tax is charged on all orders that have a shipping destination in the State of California. Will solidwoodclosets.com sell or use my personal information in any way, other than to fill my order and offer me discounts on future orders? At solidwoodclosets.com, we respect the privacy of all of our customers. We have an extensive privacy and security policy in place, to view our policy please see "Terms and Conditions" page. Solid Wood Closets, Inc. is NOT a franchise, NOR a middleman. We don't have franchise fee or markup. We are the manufacturer and distributor of all of our products, factory direct to you. That's how we can offer you an exceptional quality Closet Organizers and Accessories at a fraction of the price of similar products. Is your product comparable to our local closet company? There is NO comparison, if you're comparing us to the typical closet company. Our Closet Organizers are 100% Solid Wood with furniture quality finish, and quality hardware. We don't use particle boards, MDF, laminate like the typical closet company does. Even our Drawers are made of 100% Solid Wood. If you're comparing us to the high end cabinet/closet maker, you may get the same quality, but you have to wait weeks, if not months, and expect to pay thousands more. We have made it very easy for you to check the status of any order you place with us on solidwoodclosets.com. Simply open our "Track Orders" page and fill in the information requested. Can I make a change or Cancel my order once I have placed it? Due to the volume of orders that we process each day we will do our very best to make changes to your order if you request this service before the product is shipped. Once the product is shipped, and you need to return the product, please follow the return and order cancellation procedures on the "Terms and Conditions" page. If additional items are needed, you can easily place another order with us. Occasionally, we experience a delay in the updating of our computer system with regard to inventory levels so that items appear to be in stock when they actually are not. If the backorder will result in only a short delay, we will inform you and keep your order open, shipping the item when it becomes available. If the backorder will be for more than several days, we will inform you and ask if you want to cancel the order and issue you a full refund.